We are called by our Creator to serve our fellow human beings in a time of need with respect, patience, and love; preserving the dignity of all who come to our doors. Glendale Mission & Ministry Center (M&MCenter) is a legacy organization of the First Christian Church of Glendale (Disciples of Christ). The church voted to close it's visible worship and devote funds to form the M&M Center in October 2017. The M&M Center is focused on serving the community by providing sack lunches, clothing, hygiene kits and emergency food boxes every M-W-F from 9 am to 11:30 am. In October of 2018 we served 821 sack lunches, 57 hygiene kits, 110 emergency food boxes. Hygiene kits and emergency food boxes are provided to individuals and families every 30 days. A majority of our clients are homeless while others are working poor, disabled, or unemployed. 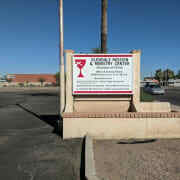 We also rent to 3 congregations who worship in our facilities and lease land to a Catholic Charities Head Start program. Would you recommend Glendale Mission and Ministry Center?